Who . . . Why . . . How? While researching the discovery of a possible man-made ring of giant stones deep in Lake Michigan off Traverse City, Michigan, I discovered a reference to a long list of other ancient megalithic structures like Stonehenge standing in place all over the world. It is said that about 1,000 other stone circles are known in the British Isles, plus some in Europe, Egypt, Israel and now at least two at and under the Great Lakes in North America. Thus we have another great mystery . . . what were these impossible unnatural rock formations, what force put them in massive circular patterns, why were they made and when did it happen? That the latest discovery lies under 40 feet of water in Grand Traverse Bay, and contains a giant bolder with a carved animal that appears to be a mastodon may really date this rock formation. If the carving is confirmed by underwater archaeologists, the entire menhir might be estimated to be about 10,000 years old and prove that humans walked the North American continent at the same time the mastodons did. It was created during or just after the last ice age, after the receding ice carved out the lake bottom and before the ice melted enough to create Lake Michigan. The Grand Traverse formation was discovered in 2007 by Mark Holley, a professor of underwater archaeology at Northwestern University, Chicago. Hollley and his team were using sonar to search the lake bottom for shipwrecks. Beaver Island, at the northern end of Lake Michigan, is the site of yet another stone circle discovered by Terry Bussey while looking for Native American artifacts in 1985. Bussey noticed that there was an unnatural pattern to 37 large stones arranged in a circle 397 feet wide. There is a giant stone in the direct center of the circle. Some kind of carving appears in some of the stones. While Bussey believes the stones align with the midsummer solstice, archaeologists who have visited the site say they are not sure she is right. Native Americans in the area do not have a history of the circle. They say their ancestors once gathered there and a stone calendar was located at the site. Hundreds of stone circles similar to Stonehenge exist all over the British Isles, although they do not receive the historical attention given to Stonehenge. They include Swinside Stone Circle at Cumbria, England, consisting of 55 stones placed in a 90-foot diameter circle. Local legend claims the devil placed the stones there to block plans for building a church on the site. 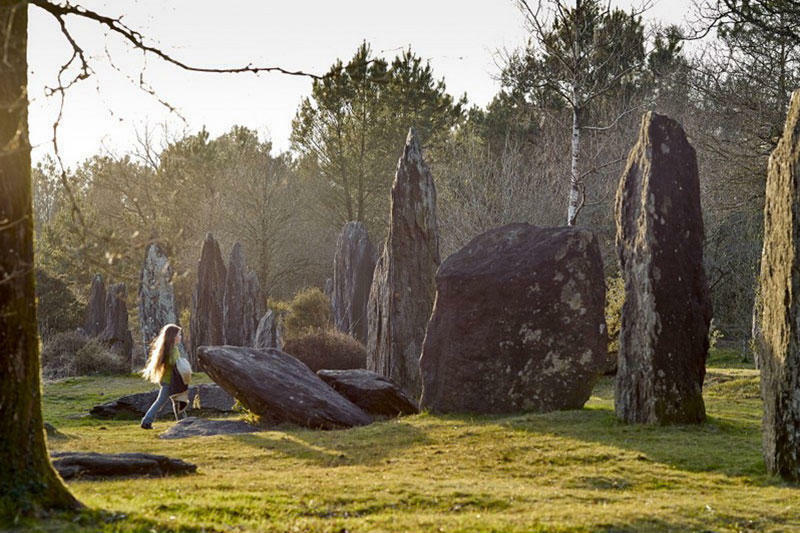 In Scotland there is the Loch Buie stone circle near Tobermory. This once was a circle of nine stones although only eight of them remain today. The circle is astronomically aligned to the winter solstice. Also in Scotland can be found the Ring of Brodgar, a monolith believed to have been built around 2500 to 2000 BC. Other ancient stone rings nearby are the Comet Stone, the Ring O’ Bookan and the Stones O’ Stenness. There is another collection of ancient stone monuments at Isle of Arran, Scotland, at a place called Machrie Moor. There are six stone circles plus several cairns, hut circles and standing stones. Near Stonehenge can be found the Avebury stone ring. It is part of a complex of ancient rock formations known as the Avebury complex; part of a collection of monoliths and monuments located along a 200-mile-long line across the land. A stone circle at Cornwall contains 19 stones in the circle plus two nearby upright stones. They are called the Merry Maidens and two pipers. There is legend that the stones were once people who were cursed and turned to stone for daring to dance on the Sabbath. Local folklore also is involved in a large English stone circle at Cumbria. There is a jumble of standing stones there. The story is told that the stones were a cursed coven of witches. Locals say the stones in the circle are uncountable but if anyone does succeed in counting them accurately twice, the spell will be broken and the witches released. It also is said that if anyone dares to move or destroy the circle, they will be immediately punished. There is a strange circle of concrete posts near Wiltshire, England, only two miles from Stonehenge that marks the spot where 168 massive wooden posts, some weighing up to five tons, made up six concentric rings. The skeletal remains of a child and a teenager were found at this site. Among the largest and most spectacular circular monuments in England are the Stanton Drew Stone Circles at Somerset. There three impressive circles stand side by side. The Great Circle in the set is the second-largest stone circle in England. Archaeological surveys have found that the site also included numerous concentric circles of the remains of wooden posts as well. In its day, Stanton Drew may have been the most spectacular circular monument to be found anywhere. Other circular monuments, both of stone and of ancient wood, have been found in England. They include Seahenge, Castlerigg Stone Circle, Arbor Low, the Rollright Stones, the Maughanby Stone Circle, the Ring of Brodgar and the Callanish Stones. Elsewhere in the world stands the Gobekli Tepe in Turkey and a stone circle at Nabta, Egypt, plus Atlit Yam and Gilgal Refaim in Israel, and Odry in Poland. These are just a few of more than 1,000 known standing stone monuments left standing all over the world, leaving archaeologists and the general public scratching their heads in wonder. Clearly there once existed an ancient culture that left no other record of its existence than the stone monuments that have defied the destruction of time. Just the act of finding, moving and lifting massive stones sometimes weighting tons, was a remarkable feat, even for a society with heavy construction machinery like we use today.